Mammals in Palestine and the Book "Mammalia Arabica"
Land & Marine Invertebrates and the Book "Aquatica Arabica"
Salam Alaikum and Welcome. You are visiting the Website of : Gazelle - The Palestinian Biological Bulletin. It gives you information about the Biology and Ecology of Palestine, concentrating on the Zoology of the Region. This Web Site comes after many years of research and studies in the field of Biology, and after publishing many issues of the Gazelle Bulletin (ISSN 0178-6288) since 1983. Salam Alaikum und Herzlich Willkommen. Sie besuchen die Webseite von : Gazelle - Das Palaestinensische Biologische Bulletin. Es gibt Ihnen Informationen ueber die Biologie und Oekologie in Palaestina, insbesondere ueber die Tierwelt im Heiligen Land. Diese Web Stelle kommt nach viele Jahren Biologische Forschung und Studien, und nach herausgeben von Zahlreichen Ausgaben von Gazelle Bulletin (ISSN 0178-6288) seit 1983. Diese Web Stelle wird unsere Kenntnis ueber die Biologie und Oekologie in Palaestina Foerdern. Eine Wissenschaftliche Reise in Palaestina, Arabien und Europa zwischen 1983-2004. / A Scientific Journey in Palestine, Arabia and Europe between 1983-2004. Erschienen: 1. Auflage. Juli 2004. 2. erweiterte Auflage. August 2004. Literaturangaben. - Parallelsacht. in arab. Schr. - Text teilw. dt., teilw. engl., teilw. arab. - Teilw. in arab. Schr. Norman Ali Khalaf, 2004, ISBN 3-00-014121-9 , Paperback kart. Preis: 35,00 Euro. 1.Auflage: 452 Seiten. 2. erweiterte Auflage: 460 Seiten. zahlr. schwarz-weiss Abbildungen - Format: 29,5 x 21 cm, Gewicht: 1170 gramm. Gaza (AFP) - Der juengsten Offensive der israelischen Armee in Rafah sind nicht nur dutzende Menschen, sondern auch zahlreiche Tiere des einzigen Zoos im Gazastreifen zum Opfer gefallen. Bulldozer der Armee zerstoerten am Donnerstag 20.5.2004 den kleinen Privatzoo im Fluechtlingslager von Rafah, wie palaestinensische Augenzeugen am Freitag berichteten. Mehrere Ziegen und Voegel seien unter den Truemmern umgekommen. Ein Affe, ein Fuchs und mehrere Ziegen haetten sich retten koennen und seien am Freitag auf dem Gelaende des Lagers gesehen worden. In dem Tierpark lebten auf weniger als einem Hektar Flaeche auch eine Giraffe, ein Eisbaer, ein Wolf, Hirsche sowie Reptilien und mehrere Vogelarten. AFP Nachrichten. 21.5.2004.
by : Frank Gardner (BBC News). The Palestinian environment minister, Dr Yousif Abu-Safiya, has accused Israel of pumping waste water and sewage into Palestinian territory in the Gaza Strip. The minister said that Israel had pumped half a million cubic meters of waste water into a riverbed across its border over the last two weeks. After nearly six months of border closures and economic despair, Palestinians living in the Gaza Strip thought life could not get any worse - but it has. According Dr Yousif Abu-Safiya, Israel is pumping 30,000 cubic meters a day of waste water into Gaza Valley. This narrow dried up riverbed runs from Israel across the Gaza Strip and into the Mediterranean. Palestinian officials fear that the next time it rains, the water will wash whatever is in the valley out into the sea. Dr Abu-Safiya says this would pollute the beaches and drive the fish further out to sea where Palestinian fisherman are unable to follow them because of Israel's blockade of the coast. But he said the biggest hazard was from harmful chemicals getting into the Gaza Strip's natural groundwater. He said the underground water was the main water source for 1.25 million Palestinians and if it became polluted, it would be unfit for either human or agricultural use. The minister said this alleged pollution by Israel, violated international agreements and could even threaten the environment of the Mediterranean. BBC News 13/3/2001. 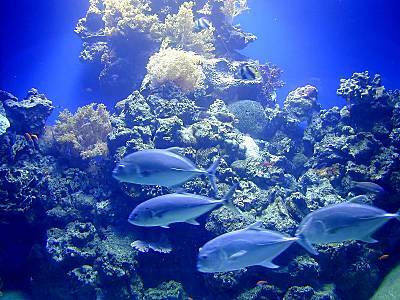 Some of the world's most beautiful coral reefs are found in the Red Sea from Eilat and south along the Sinai Peninsula. The 12 km wide bay near Eilat is shared (half and half) by Occupied Palestine (Israel) and Jordan. The Jordanian port city is Aqaba and sometimes the gulf is known by that name. Eilat is one of three Palestinian ports (also Haifa and Ashdod) and it serves to bring goods to Occupied Palestine from the Far East. Coral is best thought of as "living rock." The death of millions of tiny animals have created this limestone formation over many years. Coral "grows" very slowly and a single accident can destroy hundreds of years of growth. In 1998 a yacht broke away from the buoy it was tied to and crashed on the reef. It will take the reef at this spot 100 years to recover from the damage inflicted from this accident. Occupied Palestine (Israel) controls about six kilometers of shoreline from Eilat to the border crossing to Egypt at Taba. Technically all of Palestine's waters are a nature reserve, but the Coral Beach Reserve is only four kilometers long and much of this is not open to visitors. The temperature of the Red Sea at Eilat remains between 21-24 degrees C (70-76 F) year-round. Eilat's coral reef is regarded as a national treasure, and its corals, sponges and shellfish have been protected since 1956. The reef ecosystem is one of the most diverse in the world: 1,270 different species of fish, belonging to 157 families, make their home there, along with hundreds of species of coral and 1,120 species of mollusk. The region's rich fauna attracts frequent visits of large vertebrates, such as whale sharks, dugongs and dolphins, and the beach area is a nesting site for hawksbill sea turtles. The waters above the coral reef are a popular feeding ground and a vital resting place for some 280 species of birds that overfly this area in fall and spring, en route to Africa from Europe in the fall and vice versa in the spring. The Webmaster : Norman Ali Khalaf........This Web Site was created on 4/1/2001.